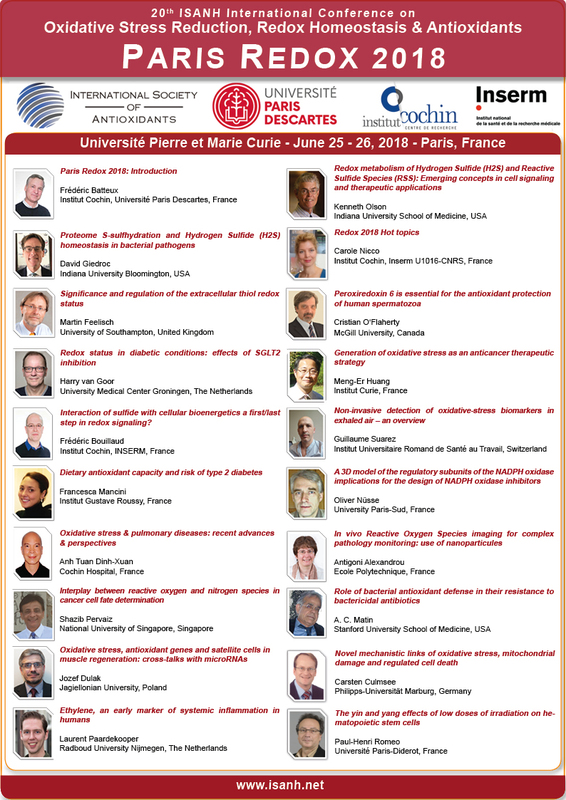 The scientific committee of Paris Redox Congress invited Prof. Paul-Henri Romeo from CEA/DRF/JACOB/iRCM/LRTS, Inserm U967, Université Paris-Diderot, Université Paris-Sud, Paris, France to present his study about "The yin and yang effects of low doses of irradiation on hematopoietic stem cells" during Paris Redox 2018 Congress, which will be held in next June 24-25, at Université Pierre et Marie Curie, Paris. According to Prof. Romeo: "Despite numerous observations linking protracted exposure to low-dose (LD) radiation and leukemia occurrence, the effects of LD-irradiation on hematopoietic stem cells (HSC) remain poorly documented. We show that adult HSC are hyper-radiosensitive to LD-irradiation. This hyper-radiosensitivity is not associated with Double Strand Break (DSB) and DNA Damage Response activation but is dependent on immediate increased levels of Reactive Oxygen Species (ROS). [...] In vivo, low-dose Total Body Irradiation (LD-TBI) does not decrease HSC numbers unless the HSC microenvironment is altered by inflammatory insult. Paradoxically, such insult, in the form of G-CSF pre-conditioning, followed by LD-TBI, facilitates efficient bone marrow transplantation without myeloablation. Thus, LD-irradiation results in a long-term permanent oxidative stress associated with detrimental effects on HSC that may lead to hematological malignancies, but LD-TBI may open avenues to facilitate autologous bone marrow transplantation."